Ecologists propose using animal song to measure forest health. 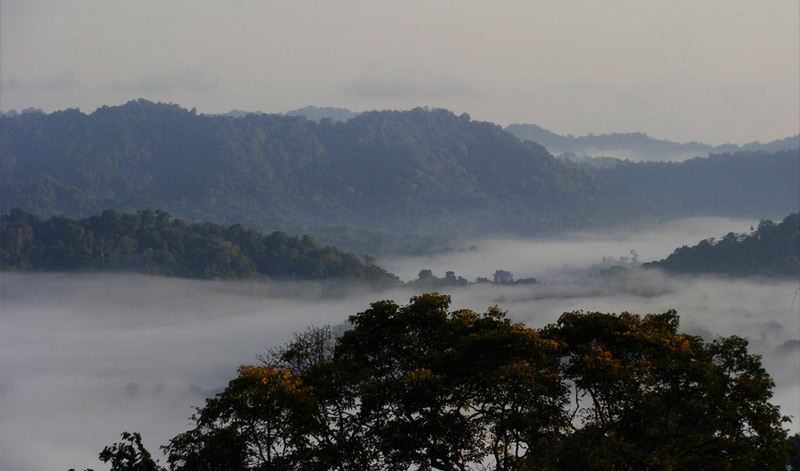 Mist cloaks part of a forest in the Adelbert Mountains, Papua New Guinea. (Inside Science) -- Every birder knows that dawn and dusk are prime time to hear an avian orchestra. Ecologists have now found that animals’ morning and evening choruses are more than just pretty music; they also contain important information about the forests that animals live in. The finding contributes to the small but growing field of ecoacoustics or soundscape ecology, in which scientists use sound to study species living in an area. Traditionally, ecologists have gathered data either in person or through technology such as automatic cameras. But such methods can be slow and laborious, and are limited to a person or device’s sight line. One audio recorder, by contrast, can gather sound from up to several hundred meters in all directions at once, and detect hard-to-spot creatures. “You can hear what you can’t see,” said Bryan Pijanowski, an ecologist at Purdue University in West Lafayette, Indiana. Using techniques developed by French mathematician Joseph Fourier in the 1820s, ecologists can separate a soundscape recording into the individual pitches produced by different animals and translate it into information, including which species are singing and the total number of species captured. “The information that you gain using acoustics is incredible,” said Almo Farina, an ecologist at Urbino University in Italy and president of the International Society of Ecoacoustics. Ecologist Zuzana Burivalova of Princeton University in New Jersey wanted to see if acoustics could be used to measure not just species but the overall state of a forest. So she teamed up with the Nature Conservancy, a large U.S.-based environmental group, which was helping communities in Papua New Guinea grow gardens and cacao plantations while setting aside areas for hunting and gathering and forest conservation. Conservancy staff had been working in the mountainous region in the country’s north for more than a decade, but had no systematic way to measure how their project was affecting the area’s biodiversity. The area is miles from the nearest road, and known for rare, charismatic species such as cassowaries -- large, flightless birds that can reach up to six feet tall -- and colorful birds-of-paradise that often sport oddly shaped ornamental feathers. Burivalova and her colleagues strapped sound recorders to trees at 34 sites scattered across an 80-square-kilometer area. They recorded for an average of 38 hours at each site, during periods of low wind and rain. Some sites were deep in the rainforest. Others were close to gardens, villages or plantations, where the forest had been disturbed, and where the scientists hypothesized that some species would likely be missing. The researchers then analyzed their recordings with software that used Fourier’s technique to separate out individual pitches. They found that “soundscape saturation” -- a measure of how many total pitches were present -- varied depending on when and where a recording was taken. Specifically, at dawn and dusk -- the times when the most animals are singing -- recordings near disturbed areas such as gardens and plantations contained considerably fewer pitches than in areas with intact forest. Their results suggest that even low-impact food production can reduce biodiversity and should be separated from conservation areas, the authors write in the journal Conservation Biology. “The approach is interesting and stimulating,” said Farina, but he cautioned that sound recordings don’t detect all animals in a forest equally. “It’s not easy to use ecoacoustics like a proxy for biodiversity,” he said. “There are many animals that are not vocal. … With birds, there are species that are singing a lot, and others that are more silent.” He suspects that soundscape saturation may better measure biodiversity among insects, bats and frogs, which tend to sing in narrow ranges, than among birds, whose songs often go up and down quite a bit in pitch. Burivalova agreed that “no single method in ecology can measure all species,” but noted that “with soundscapes you get a couple of big groups, like birds, insects and amphibians.” She is now testing the method in Indonesia, where in addition to smaller creatures, orangutans and other noisy mammals abound; early data seem to bolster the Papua New Guinea results. She thinks her team’s findings, combined with increasingly affordable recording technology, could help detect when forests are damaged but not clear-cut. This challenge has vexed conservationists for years, since the damage can happen in remote areas and is hard to measure with satellite images, according to Burivalova. “Our big overall goal is to be able to measure more objectively and cheaper and faster the degradation of tropical forests,” she said.